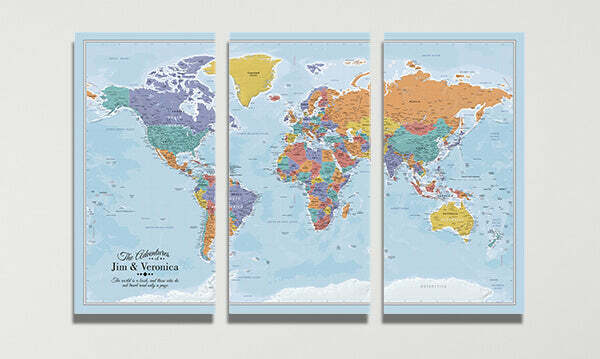 What’s not to love about our 3-Panel Blue Oceans World Map?! The fun, bright colors and extra-large size of this canvas travel map will instantly liven up the décor of your home, office, or business. 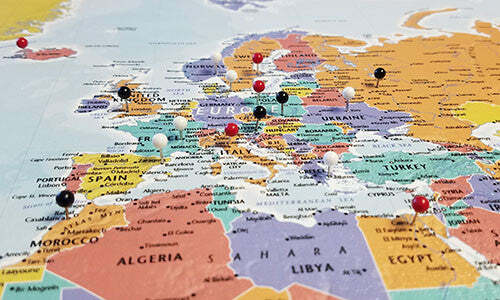 Relive your most unforgettable vacation memories with each new pin added to your map. Inspire future travels as you plan out that that next big vacation. The contemporary 3-panel gallery wrap design paired with the vibrant colors and rich canvas texture help to create a work of interactive art that will soon become your favorite conversation piece. The larger size offers more pinnable space and bigger font sizes. All 50 US states are named and outlined, making it a breeze to track both your US and globetrotting adventures. Looking to truly make the map your own? Go ahead and personalize your canvas map by adding your name, favorite quote and a pin legend. Your personalization will be printed directly on the map itself. A 3-Panel Push Pin Travel Map makes a one-of-a-kind gift idea for weddings, anniversaries, housewarmings and more!